Just in time for the holidays. . . . 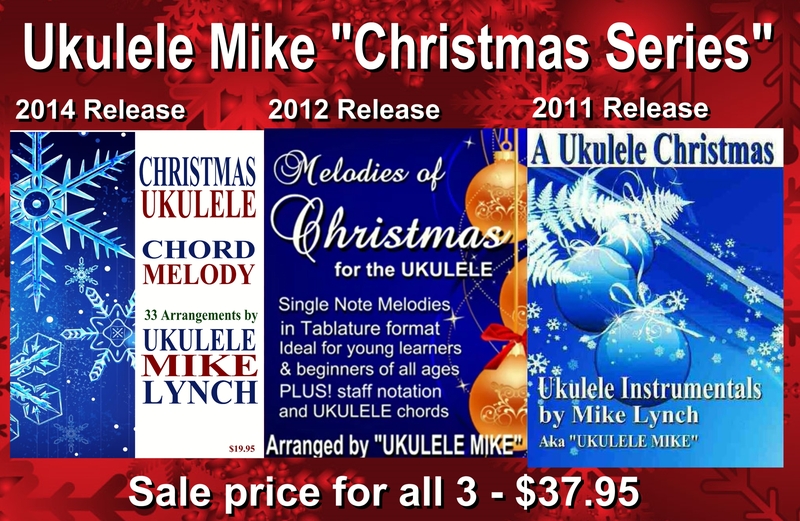 The popular UKULELE MIKE “CHRISTMAS SERIES” on sale for $37.95 . . . All three books packed with solo instrumental arrangements to last for years to come. Just in time for the holidays . . . . The popular UKULELE MIKE “CHRISTMAS SERIES” is now on sale for $37.95 . . . All three books packed with solo instrumental arrangements to last for years to come. Just make a payment through the paypal button on the Ukulele Mike website . . Once the payment is made, Ukulele Mike Lynch will personally email you the collection. Just in time for this year’s holiday gatherings or just for solo instrumental enjoyment in the comfort of your home. A timeless collection of Christmas classics that you’ll treasure for years to come.